I wrote recently about the subject of Christian confession in connection with Peter Ditzel’s comments on 1 John 1. 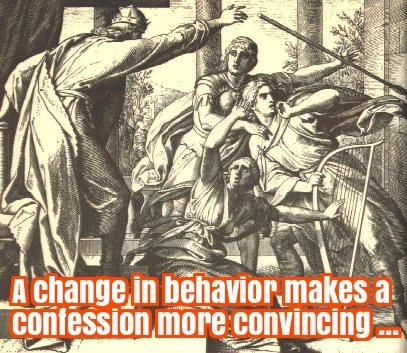 Confession is how believers deal with disruptions in our fellowship with God that come from our tendency to sin. Repentance is another part of that process. Ideally the two go together, but they are not identical. As Ditzel demonstrates, like repentance, confession has both an attitudinal and an active aspect. Both involve changes of heart and life. But while genuine repentance gives rise to confession (where confession is appropriate), not every confession demonstrates real repentance, as we will shortly observe. Thankfully, the Bible doesn’t just tell us what these things are, it also shows us what they aren’t. While he is far from the only scriptural example of phony repentance, King Saul provides one of the most practical illustrations we have on record. At least three times we find Saul making confessions devoid of real repentance. This all sounds very convincing. I suspect many visitors to Catholic confessionals appear less contrite. But we know Saul’s confession has no real repentance behind it because he can’t stop making excuses for the way he has behaved: “I feared the people and obeyed their voice”. That, and because instead of humbling himself, Saul says to Samuel, “Yet honor me now.” No truly repentant individual engages in self-defense, and no true penitent fusses about his own dignity and stature as he contemplates the evil he has committed. Both are sure signs the person doing the confessing has missed the point of the exercise. Contrast this with David, after his sin with Bathsheba and his murder by proxy of her husband Uriah. David fasted and wept, and lay all night on the ground. He made such a display of himself that the elders of his house came around to pick him up off the floor. Sure, he certainly had a motive in doing so, but my point is that he was entirely unconcerned about what anyone thought about him, king though he was. His sin and the evidence God was judging him were out there for all to see and learn from. David knew that whoever covers his transgressions will not prosper. Saul, on the other hand, offered a more private confession to Samuel in the hope of being spared greater public humiliation. In the moment, perhaps, Saul may even think he means what he’s saying. He’s certainly emotional enough, weeping and making a big public display. But confession and even emotion are meaningless when the will to change has not been touched. We know Saul’s repentance here is phony because only two chapters later, he’s right back at it chasing David around the countryside. We can’t say for sure whether Saul means this or not, because while he doesn’t know it yet, he’s nearing the end of the road. Sure, he doesn’t come after David again, but only because he will soon die in battle. But to me this smacks of cynical politicking. Saul’s own men, including his commander Abner, have twice watched David spare Saul’s life when he had the king dead to rights. To attempt now to murder David in front of them would be to give the lie to the excuses he had made to the people for harassing David, and to risk his own men turning on him. Note that the weeping is over, as usually occurs when we sin repeatedly in the same fashion. We become hardened over time. Ouch. See, to me seven times a day sounds like my brother hasn’t yet repented at all, but the Lord says that’s none of my business. He stands or falls to his own Master. My job is to forgive him from the heart when I hear him speak the words, not try to gauge his sincerity and premise my forgiveness on my own subjective conclusions. No, the lesson we can learn from Saul, I think, is to carefully attend to our own hearts and actions. Apparently it is possible to confess over and over again with no real change of life. It also is possible to be painfully aware of all the specifics of our own sins without truly rejecting them. It is even possible to be genuinely emotional without truly regretting the right things. We need to ensure that we follow the words “Please forgive me” with the appropriate life changes. Because it may take a while, but real repentance eventually produces change. It can’t be helped. Even if we go to the lengths of explicitly confessing our sins in front of the whole world, if we do not then change our pattern of life to authenticate our confession, we have only been making desultory spiritual noises. In the end, a genuine change of mind must result in a corresponding change in behavior. If it doesn’t, it isn’t yet the real deal.